Summer holidays in Spain are calling! With this amazing deal from TravelBird you can enjoy all inclusive holidays and great weather at the Mediterranean Sea! From only 2509 DKK you’ll be staying 8 days on an all-inclusive trip on Mallorca with flights and transfer from the airport included. Your 3* Blue Sea Hotel La Pinta on the famous island in the Mediterranean Sea is well-rated on Booking.com and has received a 7.4 from 10 total rating from 127 reviews. The hotel is located directly at the famous Cala Millor Beach in the village Cala Millor. While overlooking the sea you can relax at the big pool area and try the all inclusive board with great food from the buffet, snacks and drinks. Additionally every room provides a great balkony and air condition for cooling down on hot days. 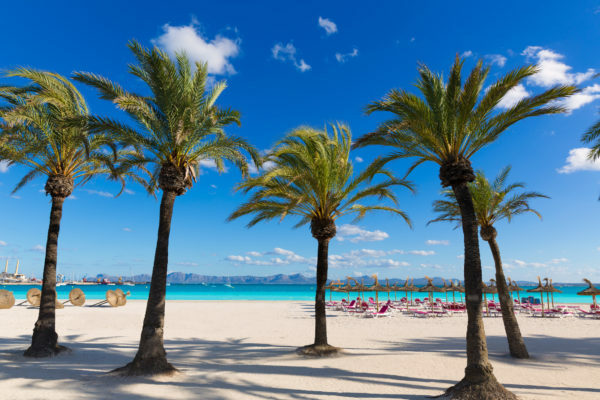 Enjoy the great weather on Mallorca and sun bathe in between big palm trees. The flights are with Ryanair or Norwegian Air from Billund or Copenhagen airport, to Palma. There are various dates from April to October 2017. In April 2017 you can find the cheapest travel date. The deal also includes the transfer from the airport to the hotel.